An enthusiastic Governor Terry Branstad rallied a crowd of central Iowa Republicans last night, promising he’s taking nothing for granted in his race against the Iowa Democratic Party’s likely nominee. “They chose Des Moines liberal millionaire Jack Hatch and I’m going to beat him,” Branstad said, getting sustained applause and cheers from the crowd. Branstad compared Hatch to Roxanne Conlin, the woman Branstad faced in his first campaign for governor in 1982. Back in 1982, Branstad attacked Conlin, who is a lawyer, and Conlin’s husband, James, who is a property developer, after the couple disclosed their net worth was over two-million dollars and the Conlins had paid no state income taxes for the previous year due to tax shelters. 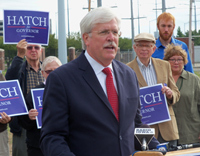 Hatch, Branstad’s likely 2014 opponent, is also a property developer and Branstad’s campaign has been raising questions about Hatch’s personal finances. Branstad does face an opponent June 3, too, as Republican Tom Hoefling got enough signatures to put his name on the primary ballot. Branstad, near the end of his remarks, asked last night’s crowd of Polk County Republicans for their votes. 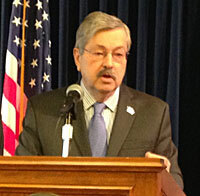 Branstad praised the six Republicans who are competing in the primary for Iowa’s third district congressional seat. Branstad also mentioned the video of Bruce Braley saying at a Texas fundraiser that if Democrats don’t win Iowa’s U.S. Senate seat, there’s a chance Iowa’s Republican senator who is a farmer, not a lawyer, might become chairman of the Senate Judiciary Committee. “Their lawyer that’s going to represent the trial lawyers in Texas, that puts down our great Senator Chuck Grassley and the farmers of Iowa, Bruce Braley, he’s their only candidate for the senate and we’re going to beat him,” Branstad said. Steve Forbes, a two-time Republican candidate for president who is the editor-in-chief of Forbes magazine, was last night’s keynote speaker.